Dusting is an important part of a normal cleaning routine. Dust can cause allergies to flair up, build up on fragile items and generally make your house look dirtier than it really is. This is a guide about dusting your home. I'm always looking for ways to stretch a dollar, and if I have something that can be used more than once, or for more than one job, I'm sold. 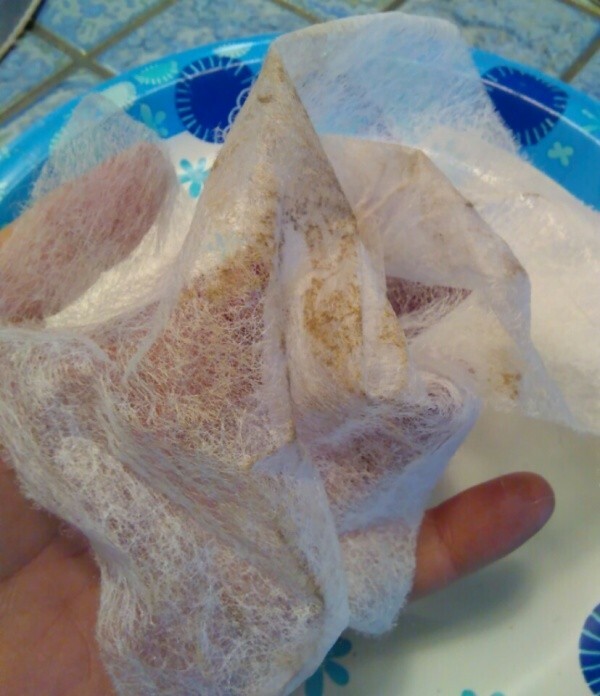 I use dryer sheets, but it seems like such a waste to use them once and then throw them away. I discovered that they are great for dusting, and since I'm buying them anyway why not? They seem to have a static charge or something similar. They work very much like Swiffers do without the cost. I keep a little bag on my dryer to collect them. Some dryer sheets work better than others, but they all leave a nice scent behind as an added bonus. Enjoy! I only use dryer sheets when I've left a tissue in a pocket. When there's static in the dryer, I'll run a wire hanger over the clothes to remove it. 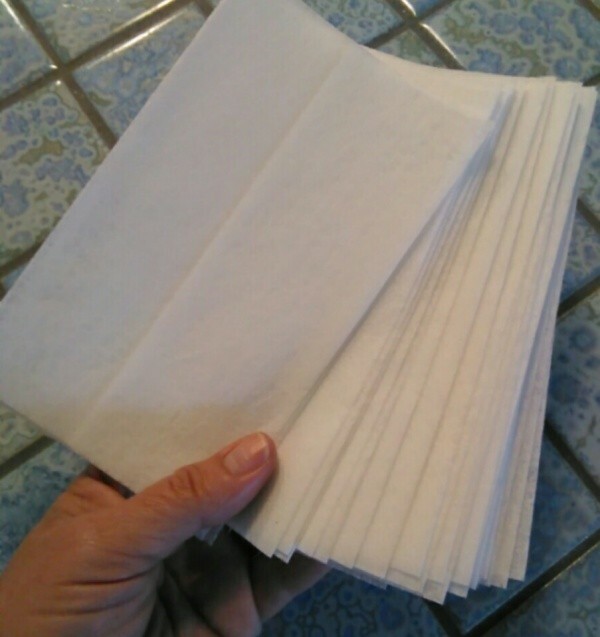 One way to save, if you want to use sheets all the time, is to cut them in half or even in thirds. For me, a third works just as well as a whole one. To dust all the furniture, I use a sheet of "Bounce" that is commonly used for the dryer. I don't know what's in it, but I save time as the dust does not stick to the furniture as much as it used to with my regular dusting cloth. Here are some dusting tips as recommended by our ThriftyFun community. If you have any advice on dusting, post them here. When white socks are starting to wear out and they are ready to toss out, DON'T. Save them for dusting and polishing furniture. 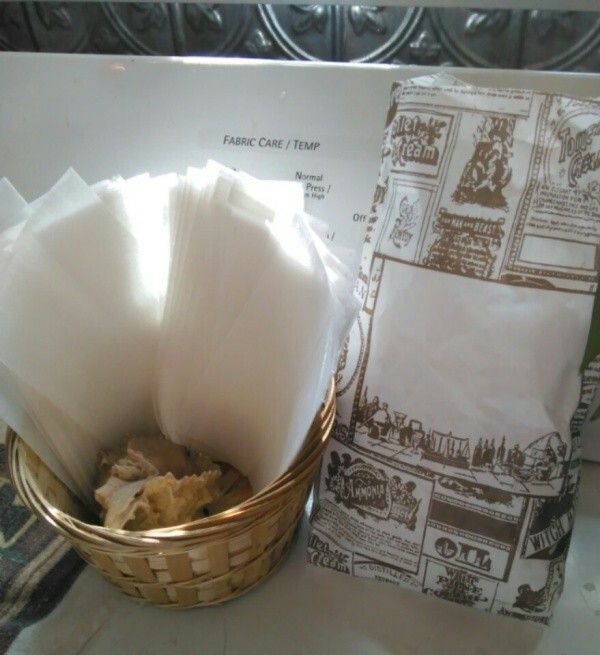 Slip one over your hand and ole, a freebie dust cloth. If you prefer, you can coat them with a light spray of PLEDGE (or whatever other brand you prefer). I've always had a hard time cleaning vinyl siding and the bricks on the exterior of my home, you know, cobwebs and dust! I found the nifty duster on Ebay that is used like a whip and let me literally beat the dust into submission. Even helped to vent my frustrations. They had a website as well, http://www.dusteroo.com - a little pricey but it worked like a charm. Great forum, thanks for providing the great tips for me and my family! I swear by this. Attach a rag sprayed with your favorite dusting spray to a broom secure with a rubber band or old hose and give your ceiling a quick dusting. it does wonders for the air quality. You probably throw out dryer sheets after the laundry is done, right? They make terrific dusters! I keep them in a stack and whenever I need to quickly clean something, they come in so handy, even better than a duster. A clean paint brush is useful for dusting hard to reach places. 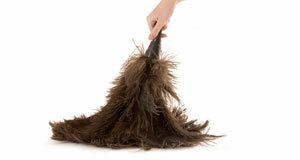 Spray your broom or dust mop with a little furniture polish and more dust will be collected as you sweep. Put old gym socks on your hands if you like the hands-on approach. Vacuum upholstery, it is often the only way to dust it and upholstery will last longer if it is kept clean. Always clean out your vacuum regularly so that it is working properly. Do you have any dusting tips? Feel free to post them below. Put on a pair of cotton gloves to quickly dust that furniture if company suddenly stops by, then shake gloves out doors and throw in washer. When dusting the house, a clothes basket comes in real handy. As you dust, take all of the stuff off the furniture and place it in the clothes basket. After dusting the piece of furniture, wipe off the items and put them back. Use the lonely lost sock from the dryer as a duster. I turn it inside out and spray furniture polish on it then swipe it where ever there is a hint of dust and voila, the dust is on the sock. Having pets in the house causes me to need to dust more often, but not with polish. So, the other day, I was stripping the sheets off the bed, and I took one pillowcase and used it to dust the bedroom. I had several old socks with holes in them. Darning was not an option. One day I was needing to dust around the TV, stereo, etc., so I grabbed one of them, sprayed on dusting aerosol and put it on like a glove. Instead of throwing those socks with holes away, they are great for dusting! You can purchase these at hardware stores, flea markets, etc. we have one and I keep it in my house, plus you can purchase air tanks to use separate. I use a small air compressor for dusting, blowing dust off of curtains etc. I love it. I live way in the country on a dirt road surrounded by trees (pollen). Along with the dust from the road and in the winter from our wood burning stove, I need help with all the dust that I can not remove from my dark finished furniture. I have tried just about everything, but as soon as I am finished, the dust starts collecting again. I am at my wits end in trying to find a solution. I did not mention all that I have tried because the list is endless. Please help me. Get rid of it and buy lighter furniture. Makes a difference. We bought a black stove one year right before Thanksgiving and it would not stay clean. A year later my daughter needed a stove and I happily obliged her with it. I got me a white one and she has the same stove today. She loves it but it bugged my hubby and myself because it always looked dirty no matter how well it was kept clean. If you plant some fast growing bushes along the road at the end of your yard and let them grow as tall as they can, they will catch most of it. You will have to hose the bushes off often. Dresser scarves and table cloths? I've spent most of my life in dusty housekeeping conditions, and finally figured out that I could either let it drive me mad, or just dust on a regular schedule and then not let it bother me. Yes, growing landscape shrubs will help cut the dust somewhat, but not really enough-ask me how I know, lol! When I had small ones at home I dusted every day but after they grew up and moved out I cut back to three times a week. My husband and I agree that is plenty, although we do wipe the cooking and eating utensils before using because of the dust. Every now and then we have a guest who makes it clear my housekeeping isn't up to their standards, but I don't let it get to me. I know I've done my best and if that isn't good enough for them then they aren't someone I need coming over too often. I feel for you since I'm in the same position. my best solution has been to buy, or crochet yourself if you know how, some pretty runners that cover the furniture tops from end to end. all you have to do then, is once a week give the tops of the furniture a wipe and shake out the runners outside. I love my furniture and would never get rid of it just for a bit of dust. How to keep dust off furniture longer? I painted my walls and apparently didn't let them dry between coats. Now my walls are sticky and collect dust horribly. I made a vinegar and water mix in a spray bottle and wipe the walls down with that, that lasts up to a month without dust whereas I was needing to dust daily before. Try that out on the furniture. It also will not hurt TV or computer screens. You can't keep it off, but if you will bite the bullet an invest ev. three months in the Filtrete kind of AC filters the dust will be greatly reduced. Keep all windows/ doors shut, and write on your 1st day of the calendar every three months to change the filters in AC and Vacuum! If you live in a particularly dusty dry area, you will have more, if not, less. 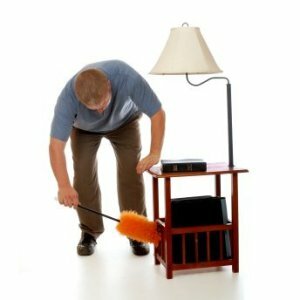 Vacuuming the furniture with the furniture attachment about monthly will also keep dust mites that burrow there, way down. Long ago women put washable covers on their furniture, then reduced them to just where the head/ arms/ hands rest, then stopped and now we have lots of dust again, right? If you choose not to vacuum the furniture or carpet before steaming them, you will have mud at the base of the fibers which will rot the threads of both as one walks or sits on the mud which becomes super grit sandpaper. There's a lot to home management properly. Problem is, I hate to do it, must push hard to make myself do it right the first time to prevent less and repeated work later. Learn from your elders! Also, vacuuming just the traffic paths almost daily will save both your carpet, the dust recycling into the air, and family illnesses! Then whole hose weekly because dust is almost invisible! Don't believe it? Get on your hands and knees and smell your carpet after a week or two of not vacuuming. Then, wait for a sun-beam to flash over some part and hit it with your hand to see how much there really is. It collects fast, so it's an ongoing battle, and one reason housewives/ homemakers Deserve a silver medal and a salary, p e r i o d! As well as a retirement savings fund other than social insecurity that the govt. Will steal now and blame on you later! Imagine having to live against the carpet all of the time like we make our poor pets and children! unpleasant, or if any parts begin looking way too old. Buy dryer sheets at your local dollar store. Attach them to the end of your broom and will pick up dust, pet hair, misc. Also, use for dusting furniture.